Set the protocol to extended in the CS setup before proceeding. Check the SX Command Station manual for the correct setting. Most Command Stations are using the 9600 as default. Check the manual if handshake is needed. 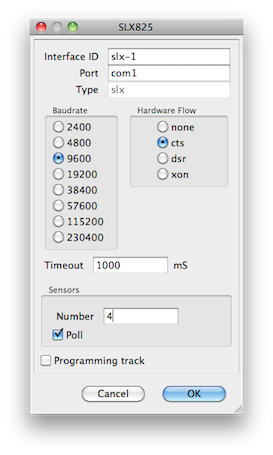 Sensors in SX systems has to be polled, and must therefor be defined in the setup. Number of connected sensor 16 port modules to be polled. The bus number specified for loco's, switches, signals and outputs is selected with command 126 before any other command is issued for this object. The bus number range is from 0 to 31, default bus is 0. Sensor definitions in Selectrix, SLX, systems must all have the same IID. Using more then one sensor system will lead to initialisation errors and the sensor system will not function correctly. An occupied sensor ordinarily supervises 8 rail segments. Every sensor has to be set to (another) Selectrix-address (from 0 to 111). If there are, e.g., two sensors A and B, one sets A, e.g., on address 90 and B on 91. Via an interface now the state of 8 rail segments of every occupancy sensor can be read. If, via the interface, address 90 (sensor A) is polled one gets just one Byte with the 8 bits representing the rail segments. 0-bit means rail segment free, 1-bit means rail segment occupied. If one wants to know the state of sensor B address 91 has to be polled. It does not matter which address the sensor has, but it should not be a loco-address. With bigger arrangements or if one has many locomotives, one can use command stations offering two SX-busses, SX0 and SX1. The rail signal is, so to speak, bound to bus SX0, i. e. all changes in the addresses from 0 to 111 on bus SX0 are sent via the rail signal. Generally SX0 is used for locomotives only. All sensors, function decoders and switches are connected to SX1. Thereby the full range of 111 addresses of SX0 is available to locos. All 111 addresses of SX1 are available for sensors, switches etc. With the bus SX0 there is one restriction: With most current command stations only addresses from 0 to 103 are available for locomotives, sensors etc. The addresses from 104 to 111 are used by these command stations for, e.g., the communication with locomotive decoders in programming mode via a connected throttle. Just for testing locomotives, switches and sensors. The test was done with Uwe Magnus' hardware.